In November 2008, we lost our 9 year old GSD. He was the second GSD we had owned, and the second to die right at the 10 year mark. We said then that we would not get another GSD until I retired. We already had two other dogs, smaller, no-particular-breed, (also rescued from dire fates) but wonderful pets, so we thought we could get along without another dog. Then, in April 2009, I came across a GSD rescue website located in AL and almost immediately found the dog we wanted. After going through the approval process, we drove 80 miles to Montgomery to get our choice. Unfortunately, when we got there, she had already been taken by another couple that very day. The foster mother then brought out 8 month old Leila. Timid and wary, Leila had cogenital mange, was severly underweight at 43 pounds and had just been rescued from euthanasia a few days before. I took her for a short walk and she was easy to control, but I could see in her eyes that she was more scared than willing. We had taken our other two dogs with us to see how they would all interact and were pleased with the result. So we loaded up our crew and headed home. They told us Leila was not housebroken, however, when we got home, the other two immediately showed her how to use the doggie door and we never had an accident in the house. The next day we took her to our vet and 8 weeks and $800 later her mange was gone and she had gained 10 pounds. We could no longer count the verterbrae or her ribs and her breastbone was no longer so prominent. Leila is no longer skittish under most circumstances. She went through obedience training and is mostly well behaved, although she does still have some separation anxiety issues. She doesn't not like to be far from my husband and will chew things up if left alone for too long. She is a runner and loves to cavort in the back yard. One of our other dogs is about 1/3 her size but they play together like they are the same size. We are contemplating adopting a Military Working Dog now. 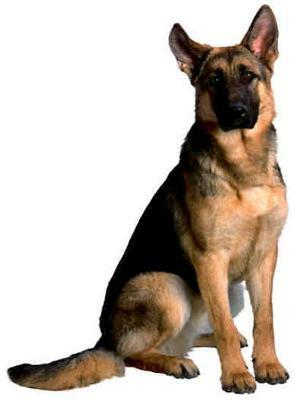 The GSD will always be a part of our life. They truly are the best dogs in the world.